Following our first NEBOSH exam past paper post, here’s the second in our ever-popular NEBOSH exam question and answer series. In it I’ve used my experience as a RoSPA Trainer delivering the NEBOSH Certificate courses to guide you through question and answers from NEBOSH past exam papers. Packed with top-tips and advice, I hope it helps you to avoid some of the more common NEBOSH exam pitfalls. These first four NEBOSH past paper questions are from Unit NGC1, The Management of Safety and Health. The marks available for each question are shown in brackets. 1.) When attempting a question about the costs of accidents to an organisation, it is best to think in terms of insured costs (such as those associated with loss of production or damage to materials), and uninsured costs (such as a detrimental effect on employee morale, resulting in more down time and higher staff turnover). You can also answer in terms of the direct and indirect costs of the accident to the organisation. Indirect costs (such as increased insurance premiums, uninsured criminal and civil actions and damage to the organisation’s image) are usually far higher than anticipated by an organisation and therefore more marks could be gained by focusing on this area. 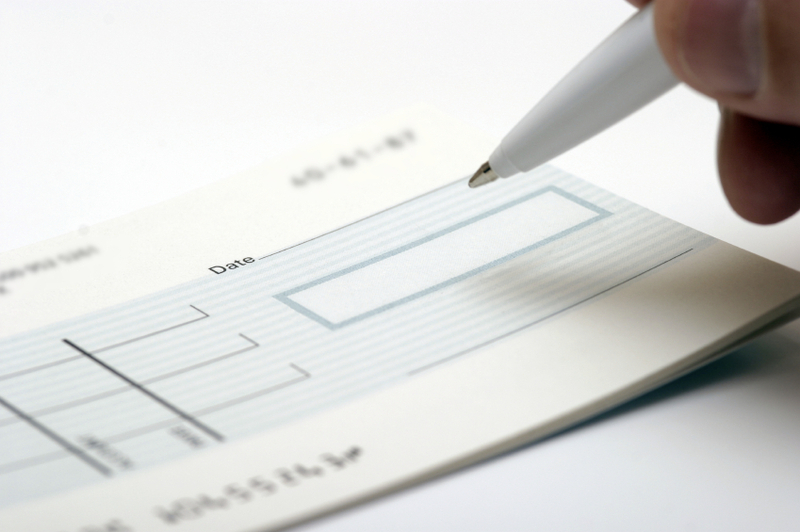 Consider the direct and indirect costs of an accident. Remember that in this question it is important to focus on the costs to the organisation, and not to other parties. If you’re using Hughes and Ferrett’s Introduction to Health and Safety at Work 5th Edition you’ll find this covered on pages 6 – 8. 2.) This question would be best answered by splitting it into two with one paragraph on Improvement Notices and one on Prohibition Notices. Then identify the characteristics of the two types of notice to gain the marks. The key difference to remember is that an improvement notice may be served where an inspector is of the opinion that there is a breach of a statutory health and safety duty, or that there has been such a breach which is likely to continue or be repeated. The more serious prohibition notice may be served only where, in the inspector’s opinion, there is a risk of serious personal injury. In the latter case, a breach need not have occurred for the notice to be served. If you’re using Hughes and Ferrett’s Introduction to Health and Safety at Work 5th Edition, you’ll find this covered on pages 17 – 18. 3.) 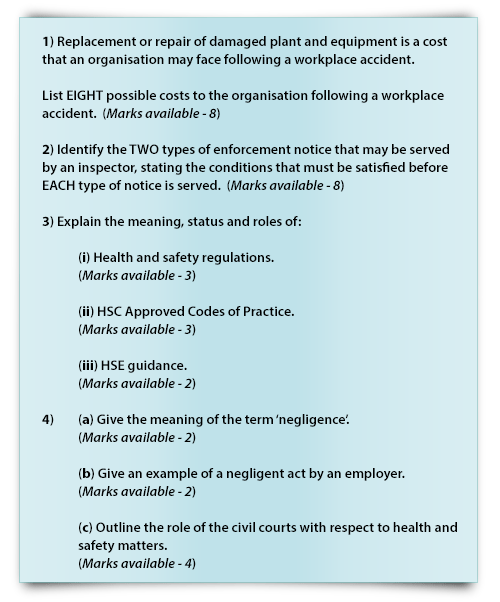 To make your answer clearer for the examiner you should number your answer to reflect the question and answer in three sections, looking at regulations, ACOPs and HSE guidance respectively. You also need to make sure that you have identified the characteristics of the three and to a sufficient depth to collect full marks for each section. Be warned however that with a question like this it can be easy to spend too long on it and lose time elsewhere in the exam so try to stick to your timings – you can always come back and add more detail at the end of the exam if you have time to spare. (You can read more about the time and marks available for answering NEBOSH exam questions in our top-tips for passing NEBOSH exams post). As always, with regulations and ACOPs it is important to focus on their legal status and with guidance it is important to focus on it being good practice. Therefore, for part (i), you should state that regulations dictate minimum legal standards. Breaches of regulations constitute criminal offences that can lead to enforcement action, with the possibility of prosecution and the imposition of fines; that most health and safety regulations are made under the Health and Safety at Work etc. Act by the Secretary of State after consultation with HSC; and that they often implement EC Directives that are aimed at protecting employees and others. 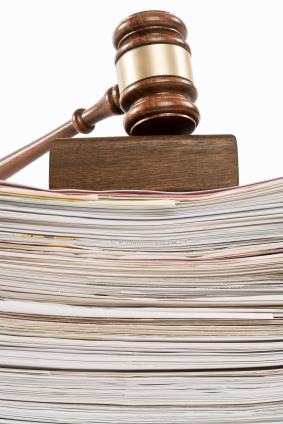 Focus on the legal status of ACOPs and regulations. For part (ii), duty holders must comply with the requirements of an ACOP or be able to show that the chosen means of control are equally effective. ACOPs are approved by the HSC with the consent of the Secretary of State and their purpose is to provide practical interpretations of legal requirements in specific areas. For part (iii), HSE guidance has no formal legal standing, is generally more informative and practical than an ACOP, and is intended to give advice on good practice. If you’re using Hughes and Ferrett’s Introduction to Health and Safety at Work 5th Edition you’ll find this covered on pages 15 – 16. 4.) Again, split your answer into three parts to mirror the question. For part (a), negligence is doing something a reasonable person wouldn’t do, or failing to do something a reasonable person would do. In essence, it’s a lack of reasonable care or conduct. For part (b) examples of negligent acts by employers can include a failure to provide a safe system of work, a failure to provide safe equipment or a failure to provide the necessary safety training. Appeals from the Court of Appeal are heard by the House of Lords, whose decision sets the precedent for all courts below it. For those using Hughes and Ferrett’s Introduction to Health and Safety at Work 5th Edition you’ll find this covered on pages 9-12. 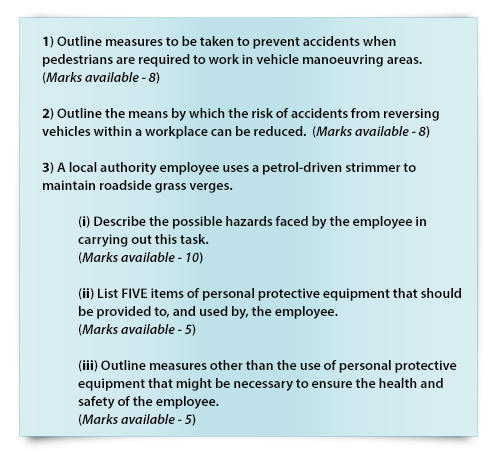 These next four NEBOSH past paper questions are from Unit NGC2, Controlling Workplace Hazards. Again, the marks available for each question are shown in brackets. 1.) This workplace transport question will allow you to outline the main controls that can be used to separate people and vehicles. It may help to imagine a number of workplace scenarios such as a warehouse, factory and loading dock. You could group your answer into the areas suggested in HSG 136: safe person, safe vehicle and safe site. Staff safety training and adequate supervision. The segregation of people and vehicles is key. For those using Hughes and Ferrett’s Introduction to Health and Safety at Work 5th Edition you’ll find this covered on pages 214-219. You could start with one-way systems and turning circles to restrict the need for reversing. Then consider procedural measures such as driver training and banksman training and deployment. 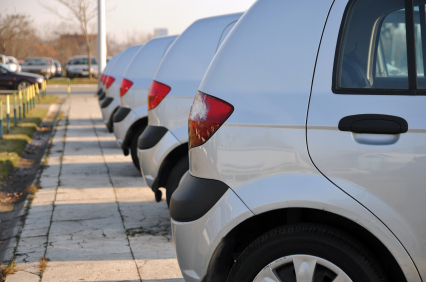 Driver training may form part of a strategy for managing workplace transport. 3.) Familiarity with the different types of work equipment that are on the syllabus will help to ensure there are no surprises in the exam. On this occasion the question regards a strimmer, but as many of the relevant hazards and safeguards also apply to other work equipment that may appear in a NEBOSH exam question your familiarity in this area can help you in others. The hazards associated with the storage, transfer and use of petrol. Overall protection from the weather (be it sun or rain). For part (iii), outline measures that are not related to PPE such as regular breaks, job rotation, traffic control measures, maintenance of equipment, safety training and health surveillance. 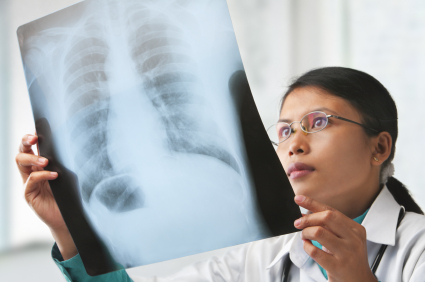 Consider the need for health surveillance. For those using Hughes and Ferrett’s Introduction to Health and Safety at Work 5th Edition you’ll find this covered on pages 271, 278, 366-370. I hope you’ve found these NEBOSH exam tips useful. If you’d like to be notified when further questions and answers are posted add your email address to the ‘Follow this blog’ field in the top right. Very best wishes in your forthcoming NEBOSH exams. What is Driver CPC and do you comply? my email ID is pbphad@gmail.com.